Big data is an indispensable part of the Cloud Computing universe. 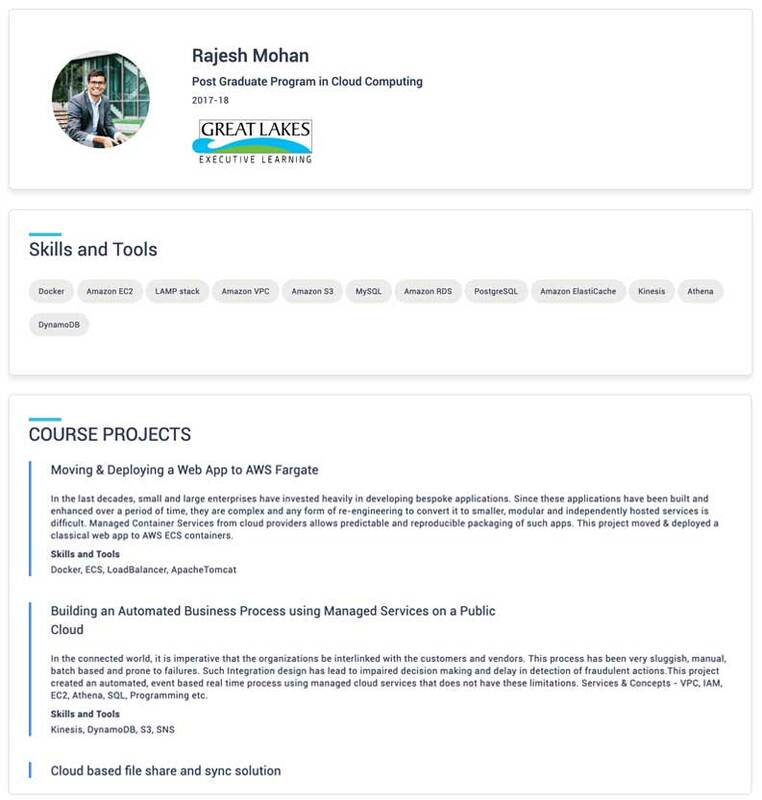 Great Learning now offers a course to help you implement & analyze Big Data on Cloud. This is an advanced course offered exclusively to students enrolling in the PGP Cloud Computing program. Today, we’re surrounded by data. People upload videos, take pictures on their cell phones, text friends, update their Facebook status, leave comments around the web, click on ads, and so forth. Machines, too, are generating and keeping more and more data. To process such large datasets, there is a need for specialized tools. This course covers two important frameworks Hadoop and Spark, which provide some of the most important tools to carry out enormous big data tasks.The first module of the course will start with the introduction to Big data and soon will advance into big data ecosystem tools and technologies like HDFS, YARN, MapReduce, Hive, etc. In the second module, the course will take you through an introduction to spark and then dive into Scala and Spark concepts like RDD, transformations, actions, persistence and deploying Spark applications. 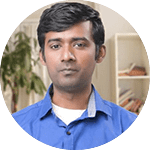 The course also covers Spark Streaming and Kafka, various data formats like JSON, XML, Avro, Parquet and Protocol Buffers. Kafka - What and Where? 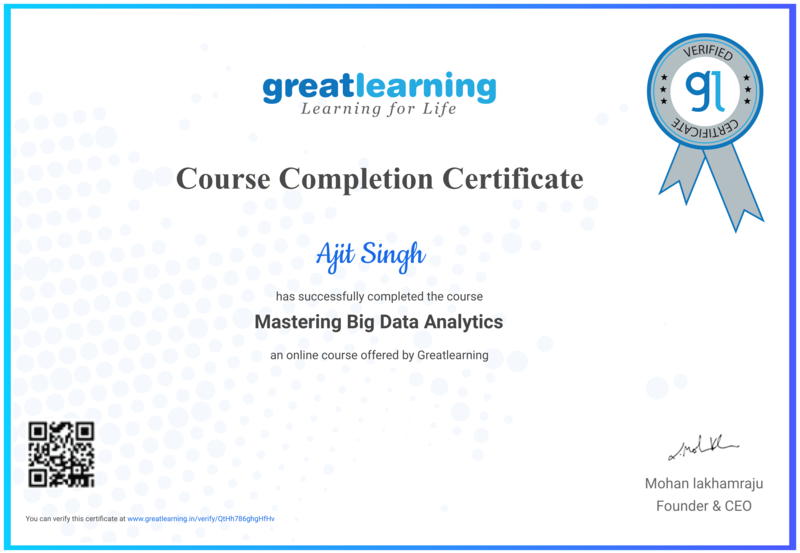 Get Mastering Big Data Analytics course certificate from Great learning which you can share in the Certifications section of your LinkedIn profile, on printed resumes, CVs, or other documents. The Projects and Skills acquired as a part of this course will have a special place in your ePortfolio. The course content access will be provided to you immediately after you enroll into the course. For what duration will I have access to the course? The course will be available to you for a lifetime. You can revisit the course content anytime you want. Whom can I contact if I have queries regarding the course? Once you enroll, you will have access to a course discussion forum where you can post all your queries and they will be answered by GL Gurus. What will be the mode of training for this course? This course will be completely online and will provide you with access to high-quality content videos, quizzes, case studies, and real-life projects. There will be a discussion forum where our GL Gurus will be available for answering your queries. Will the training and course material help me prepare for the Big Data Hadoop certification exam? 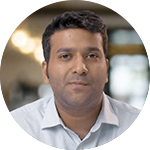 Yes, Great Learning’s training and course materials will prepare you for the Big Data Hadoop certification exam. The NYC taxi trip Analysis project is as elite as it sounds. The dataset is well designed to put your big data skills to the ultimate test. The project will untie your potential to hone as well as master exploratory data analysis on the given dataset. The ultimate aim of the project is to derive the highest possible revenue figures using Hadoop and Hive. With over 500 million tweets wrapped up in 280 words, Twitter is the home to one of the crispest and concisely written content on the web. From space tweets to ( Lebron James’ on chicken nuggets OR Donald Trump’s infamous ‘covfefe’ tweet), it hosts ideas, comments, and sentiments with minimum jargons and more information. This makes it an ideal platform for Sentiment Analysis using Machine Learning.